BANGI, 26 November 2014 – The National University of Malaysia (UKM) has been given a grant US$1.425 million to implement the Asean Youth Volunteer Programmes (AYVP) for the next 3 years beginning from next year. The grant will be utilized to fund volunteer projects throughout ASEAN and is expected to benefit hundreds of students in the region through more than 75 projects. UKM which have been active in giving exposure to youth to engage in volunteer work in ASEAN will be the secretariat for the programmes. 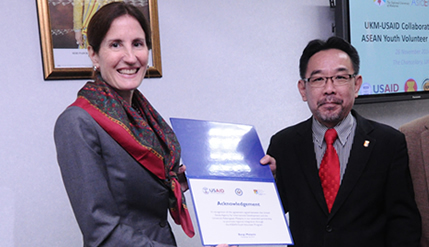 Deputy Vice Chancellor (Industry and Community Partnership) Professor Dr Imran Ho Abdullah represented Vice Chancellor Prof Datuk Azlan Ghazali at a meeting with USAID and the US Ambassador to ASEAN, Nina Hachigian. He said AYVP is one platform where youth across the region can discover their shared identity and developed their leadership potentials. Through AYVP youths in ASEAN can create innovative solutions to assist in solving some of the region’s most pressing problems affecting its community. It will also give the youths taking part, the exposure and experience to be competent and empathetic leaders, Prof Imran said. The US ambassador to ASEAN Nina Hachigian said AYVP is a platform that can bring the people of ASEAN closer together saying that the US is interested to see that peace and security in Asia is maintained. She said that ASEAN unity is not only good for ASEAN but for the United State and also the world. Hachigian said the best way to not feel hopeless is to get up and do something and not to wait for good things to happen. If you go out and make good things happen you will fill the world with hope and you fill yourself with hope. Deputy Director USAID Regional Development Mission for Asia, Ms Carrie Thompson then presented Prof Imran with the Acknowledgement Certificate for the grant. Under Secretary International Division of the Ministry of Youth and Sports Malaysia R. Effendi Razali also attended the meeting.